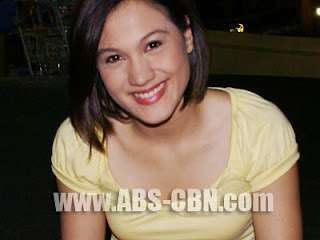 Roxanne Guinoo is of Filipino and German descent was become an actress and host in wowowee.wow great ! Filipina actress Roxanne Guinoo was born on February 14, 1986 in Rosario, Cavite.Her parents are Bernardo Guinoo and Ana Bosch. She is the youngest in a brood of four girls, and was overprotected and sheltered. She even recalled a time when she cried because she was not allowed to go to a fast food chain along with her friends.She really can't go out without any companion,was been over protected. She attended highschool at Atheneum Amcan School in Noveleta, Cavite . She then attended college at De La Salle University Dasmariñas. Roxanne was been auditioned for a drama club called Teatro when she was high school. She passed, but her parents stopped her. Another challenge She auditioned for Star Circle Quest in SM Bicutan with her sister to accompany her.She first appeared in the first season of ABS-CBN's teen edition of Star Circle Quest. She was paired up with fellow Star Circle Teen Questor Joross Gamboa during the competition, and their pair was dubbed "JoRox". The two of them were part of the contest's Final 5 or "Fab 5" along with Melissa Ricks, Sandara Park and Hero Angeles. Roxanne finished as second runner-up, with Sandara being the first runner-up and Hero winning the competition. Wow nice. Roxanne confirm that she had already freedom upon joining SCQ and that She was finally allowed to go wherever she wanted even when she came from an overprotective family, Roxanne has never had a boyfriend until she entered SCQ. Guinoo is a member of ABS-CBN's elite circle of homegrown talents properly named Star Magic. Presently she has appeared as model for White Castle whiskey and has posed for Maxim magazine.She is currently a co-host on the noontime game and variety show Wowowee. Her exciting moment when she fall in love with love team partner Joross Gamboa.But sad to say their relationship lasted for more than a year only, and finally they breakup. Roxanne accept the reality that she has been heartbroken after the breakup, but as time past she recovered. So both of them we're totally remain good friends.She also Jake Cuenca former girl friend.oh my gosh.They both are good partner but sayang break-up then.So good luck to you beautiful Roxanne wish you the best luck.Take care and just keep up the good work. Matt Evans a filipino-american mix and was become an actor . as the "happy-go-lucky", afro-haired Teen Housemate and later became famous for his portrayal of Pedro Penduko in Komiks Presents: Da Adventures of Pedro Penduko. He has 2 half brothers, Mark and Akira. Evans' birth father abandoned him and his mother when he was just a baby. When he entered the Big Brother House, him and his fellow housemates Gerald Anderson, Mikee Lee, and Brenda Fox tried to find his birth father, but there was no luck. To this day he continues to look for his real father. He recently broke up with former teen housemate,Olyn Meimban,and they met on Pinoy Big Brother Teen Edition where they were known as the "Aso't pusa" loveteam. After the season finished, Evans surprisingly visited Meimban's house to ask permission from her parents to start courting her. Meimban's first reaction was, " Seriyoso ka ba?" They have dated for 2 years. Meimban is Evans' longest relationship.Good luck to you Matt. Melissa Ricks is of Filipino-American mix and was become Filipina teen actress. Melissa Marie Ricks ,was born on (January 9, 1990 ) a Filipina actress and was a Filipino-American Mix. Her talents are acting,singing, dancing, and modelling. Her idols include Luis Manzano, Carlos Agassi and Heart Evangelista. Her hobbies include swimming, watching TV and hanging out and one of her most unforgettable experience when she joined SCQ was when she met Heart Evangelista. After the contest, she was a guest in some TV shows of ABS-CBN particularly in the youth oriented drama SCQ Reload and variety show ASAP Fanatic.She received one of the biggest breaks when she portrayed Hiyas, the apple of Pedro Penduko's eyes in the fantaserye Komiks Presents: The Adventures of Pedro Penduko and when she starred in the primetime drama series Iisa Pa Lamang lead by Claudine Barretto. She was one of the stars in Kambal sa uma, an afternoon drama series on ABS-CBN with Shaina Magdayao, Ms. Rio Locsin, Matt Evans, Jason Abalos and many more. She's good actress and lovely too ,I watch her movie in Kambal sa uma ...ang ganda nya at mabait pa.
Rayver Cruz...A filipino actor and dancer. Raymond Oliver Cruz Illustre,(born July 20,1989),known by his screen name Rayver Cruz.He is a Filipino actor and dancer.He is a member of the revered Cruz family, a reputable family line in the entertainment industry of the Philippines. His father recently died from kidney . He has two brothers, Rodjun Cruz and Omar Cruz-Illustre. His father recently died from kidney failure (Rodolfo Illustre, Sr.; 1934-2009). He is currently part of ABS-CBN contract talents. 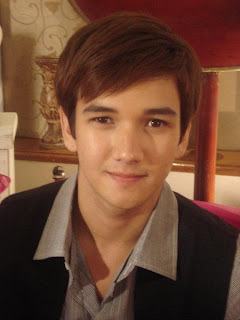 He started as a child star in GMA 7 in the comedy sitcom Kiss Muna together with Joey de Leon, Ara Mina, etc. when he was just 9 years old. Rayver also appears on the noontime variety show ASAP '09. Cruz is a member of ABS CBN's elite circle of homegrown talents properly named Star Magic. He's also cousin to actresses Sheryl Cruz, Sunshine Cruz, Donna Cruz and Geneva Cruz. Wow great. He’s being linked to Shaina Magdayao and their loveteam is currently one of the hottest in Pinoy showbiz nowadays. Rayver has also ventured modeling and he now belongs to the elite group of Bench models. Mark Bautista a Filipino Singer ,Actor and commercial model.He has wonderful voice too. Mark Bautista was born on August 10, 1981 in Cagayan De Oro City, Philippines.His parents are Darni Bautista and Susan Bautista...He has four siblings (an older brother, a sister and 2 younger brothers). Mark was determined to help his family when his father was forced to stop working because of the physical condition.When he won the cash prizes at singing competitions, he was able to help his parents through their financial status difficulties.He was a finalist of Philippine reality show Star For A Night and eventually placed second behind Sarah Geronimo.He has recorded albums and gained a starring role in a movie, lead roles in soaps and drama specials, TV hosting stints and product endorsements.He started singing publicly when he was in high school.Unfortunately, it wasn’t his time to be discovered yet. He continued polishing his craft by singing with his group. He joined a boy band called Voizemale. They performed at the Warehouse, a bar in CDO. The group performed songs from Earth, Wind & Fire to current hits at that time like Backstreet Boys, etc. Another opportunity comes to Mark. It was an audition for a singing contest called Star For A Night hosted by Regine Velasquez. The auditions were being held in Cebu. Money was an issue at that time so Mark thought he was not going to miss this big opportunity. Mommy Susan provided Mark with money to go to Cebu as a birthday gift. To go further in the competition, Mark had to go to Manila and finish the remaining levels of the audition process. He hitched in a cargo ship to be able to reach Manila in time for the auditions. Mark was blessed after all.Sarah Geronimo and Mark was a good pair.They had great made movies.I saw them last time in the Tv series and I like their show.Amazing lovely.oh yeah. A filipina singer and was become actress and also model was Ms. Sarah Geronimo. Sarah Geronimo (born on July 25, 1988), is a Filipina singer and actress. She signed a recording contract with VIVA Records after winning a singing contest.Sarah Asher Tua Geronimo was born to Delfin Geronimo, a retired PLDT employee, and Divina, who ran a home beauty parlor in Sta. Cruz, Manila. Sarah is the third of four children. Her siblings are Jonnah Rizzie, Sunshine Grace, and Ezekiel Gabriel. Adolfo "Ka Gerry" Geronimo, a TV host and owner of production company is Sarah Geronimo's uncle.After a year, she entered ABS-CBN, and acted on shows like Bituing Walang Ningning at Pangarap Na Bituin.She made movie after all. Sarah's voice is versatile enough to conquer every genre.She was a great singer. She signed a contract with ABS-CBN, where she had her first acting project starring in a drama series entitled Sarah, The Teen Princess.She also was in a musical variety show, ASAP.Geronimo sang the theme of a Star Cinema movie, Can This Be Love. She also became part of the fourth season of the weekly teen-oriented program, SCQ Reload, Kilig Ako.Sarah reunited with her fellow champions for a US Tour of Pinoy Idols: Return Of The Champions, which showed in selected cities in the U.S. for a two-month period. She was cast in ABS-CBN's primetime soap opera, Bituing Walang Ningning as an aspiring singer named Dorina Pineda. She also released a soundtrack of the series.She also took the lead role in ABS-CBN's primetime drama Pangarap Na Bituin opposite Jericho Rosales, along with Maja Salvador, Rica Peralejo and, Nikki Gil as "The Jewel Sisters. Watch out guys...you will be her admirer ...right!I'm very proud of her.Wishing her the best luck always.